If Wade Cook’s Safety 1st Investing was a Stock 101 class, and Saliba’s Options Workbook was an Options 101 Class then Options Made Easy is an Options 201 course. This book expands on both of the previous books I reviewed and provides advanced concepts encompassing more theory, graphs, and charts. You will also get an introduction to the greek alphabet and the terms associated with things like Delta, Theta, Gamma, Vega, Rho, and Zeta. I did find this book educational and I’ll likely have to read it a few more times before a few of the more advanced concepts sink in but I didn’t really learn anything new to improve on my ETF Covered Call investment strategy. I’d recommend this book for anyone wanting an advanced understanding of options trading. If you’re new to options trading, I don’t recommend you start here since you’ll likely be overwhelmed rather quickly. I also recommend that you stop by later this evening over to http://www.etfcoveredcalls.com to see how I’ve managed to avoid losing a single penny during this down market. I’m not a big fan of technical books but I make it a point to try to always learn something new even if it’s something I’m not crazy about so I picked up Anthony J. Saliba’s The Options Workbook 2nd Edition to get a technical perspective on options trading. This book covers almost every definition in the Options Trading world. The book is written almost in classroom format so that each chapter has various exercises at the end to review and test your retention. This book does somewhat complement Wade Cook’s Safety 1st Investing as Cook’s book provides a basic concepts overview, this book provides detailed mathematical formula and theory. I would recommend this book to people new to options trading. I would also recommend this book to people who are familiar with options trading but need a refresher on the theory or math behind options trading. I would also recommend this book to people who are young; I wish I could make this mandatory to all high school graduates or perhaps as a weed out course to college students as it provides an answer to what every working person will ask once they begin to earn an income: How do I invest the money I earn? The book I have was actually published in 1999 and no doubt, was written to capitalize during the dot com boom, but the strategies are still usable today. I like buying older books on occasion to find if they stand the test of time. What might have been popular 8 years ago may not be so popular today but I find that options trading has increased significantly since the late 90s so the book does hold up against time. If you need an overview on different trading methodologies and understanding the importance of keeping up with the news and company’s financial statements then you should consider reading the book. If you regularly visits sites like finance.yahoo.com to check out a company’s balance sheet, income statement, cash flow, options and stock price, and trade (even occasionally) calls or puts then you probably won’t get much out of the book. It is comforting to know that there are people out there that think the same way I do and Harv Eker’s The Millionaire Mind covers many topics I’ve covered here on my blog over the past year. If I ever sat down to write a book, it might nearly be The Millionaire Mind almost word for word! I’ll get the suspense out of the way, EVERYONE should buy this book; if you don’t have any money, go to your local library to check it out or ask for it as a birthday present. The book explores what really keeps people from getting rich: Themselves! I wrote recently a compilation of the top 10 excuses I’ve personally heard over the year why people weren’t getting rich and Harv pretty much covers them all in his book. Harv, however, delves into the psychology behind the excuses and his findings are quite profound. The entire principle of the book starts with each person’s money blueprint. The environment you grew up in provides the foundation for how you’ll live the rest of your financial life. If you had a religious upbringing in which your parents instilled in you that wealth was evil then there is a high likelihood that you’ll feel the same way about money and handicap your potential financial success. One of the things I love about the book however are the “wealth principles” scattered throughout the book. You income can grow only to the extend that you do. The only way to permanently change the temperature in the room is to reset the thermostat. In the same way, the only way to change your level of financial success “permanently” is to reset your financial thermostat. I won’t write much more about the book because I think everyone should read it and I’m certain that everyone will find a reflection of themselves in at least one of the chapters in this book. Frugalists – Bloggers who primarily write about saving money, clipping coupons, getting free products/services, etc. Headliners – Bloggers who primarily “borrow” news headlines and blog about the headline/article. Debtors – Bloggers who primarily blog about their debt and journey to escape debt hell. Capitalist Level 2 – Bloggers after serious money with interesting, innovative, aggressive and/or conservative investments (real estate, option/equity traders, dividends, commodities, etc). I consider at least 25k in play the starting level for this group but there can be exceptions. 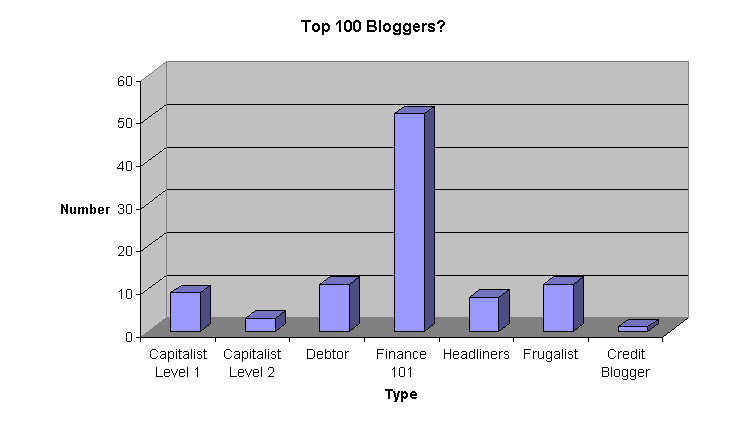 As I went through I put each blog into one of these categories but there were a couple that didn’t fit such as Pfblogs.org and one blog dedicated to credit card blogging which didn’t quite fit. I created this chart in Excel to illustrate the breakdown. The list actually contained 95 blogs not 100. 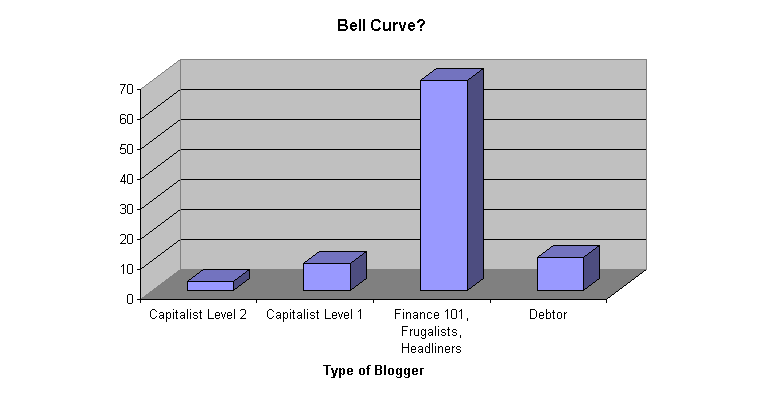 The first thing that popped into my mind as I saw the result was the famous “bell curve” and my goal wasn’t to do graphs or charts to illustrate that point – I was simply trying to find Level 2 Capitalist bloggers. If you take the headliners, frugalists and finance 101 bloggers and lump them together you get a perfect 70 which represents 73.68% of the group. This was totally unintentional on my part! Research often shows that like minded people tend to want to group with each other and perhaps my unscientific review illustrates that point but I did happen to find a few blogs that I did like and I’ll review them more thoroughly before adding them to my Capitalist Blogroll. By the way….which would YOU consider the “A” students, the “B” students, the “C” students and the “D” students? I am truly amazed at how the internet is transforming the business world on so many levels. A few weeks ago I posted a review of a book that changed my whole outlook on investment strategy Covered Calls & Naked Puts and a couple of weeks ago I was contacted by the author of the book via comments to my blog here and here. I can give you an assurance that you will learn something new about investing if you read the book. I have not asked nor do I receive any compensation from Ron Groenke. I am simply happy to provide a recommendation for a book (and investing strategy) I strongly believe in to my readers. Disclosure: The author has sent me an updated version of the book now named Cash for Life for review. While I haven’t yet officially received the book, a friend of mine has informed me that it has arrived at his home (was out travelling so I had it sent there). I’ll post a review sometime in the near future of the new book along with some others recommended by readers. It’s amazing to think that it has almost been 10 years since I picked up my first “finance” book. I tend to keep all my finance books and last night I glanced at the first one I had purchased; it was a book named The Truth About Money by Ric Edelman published in 1996. Ric Edelman subsequently came out with a new book (after tax law changes) called The New Rules of Money a couple of years later. I picked up that book too. Note: There are now 2nd and 3rd edition of The Truth About Money. This review is about the original published in 1996. I’m reviewing both of these books today from a historical perspective. From 1995 through 1998, the stock market was booming. It’s funny to read Ric talk about 20% returns being common for equities and U.S. Treasuring paying a “paltry” 6.5%! Funny how today we WISH U.S. Treasuries were paying 6.5% and only dream of 20% average equity returns! It’s also interesting to note how global events really can make a difference. From $60-$80/barrel oil to 9/11 to Enron scandals, the markets have taken hits and yet they manage to hang on. Both books contain Ric’s “Rules of Money” which often provide useful ideas, sometimes contrary to popular dogma (Ric doesn’t like index funds) and at other times fairly basic and common sense advice (spend less than you earn). Ric Edelman also dislikes the Roth IRA (or at least he did when these books were written) for various tax implication reasons that may or may not apply to the average investor. As a finance/investor novice in 1996, I thought Ric’s advise was gold but now I believe it to be more like silver -still valuable but there’s better out there. I don’t recommend you go out and buy these books but its fun to re-read books that were written during an equities boom period and the assumptions and advice they give during these times. I glanced at Amazon’s reviews to see how people were ratings the book and people either love it or hate it. Of course, Ric now has some new books one of which is called What to do now written after the dot com meltdown and 9/11 attacks. I haven’t picked that up but the Amazon reviews have the ratings as “hated it” or “loved it.” No doubt, Ric Edelman is a controversial financial advisor but I’m beyond the advice he doles out in his books at this point. While not exactly a finance strategy or tactics book, Atlas Shrugged by Ayn Rand is a MUST read book for all investors. The book was written over 40 years ago but I continue to see parallels of her fictional world and our real world today. Essentially, the book is fictional account of various entrepreneurial capitalist characters who find themselves being swallowed whole by a global socialist movement. In the text, the socialist movement begins in foreign countries with various announcements that various industries (mining, transportation, etc) have been nationalized by newly elected socialist governments. If this sounds familiar in our real world you might recall Bolivia recently nationalizing their gas industry, Mexico nationalizing the oil industry and Venezuela threatening to nationalize just about everything. In the book, the United States becomes the last bastion of free enterprise and capitalism in the world but it too slowly begins to slide towards the socialist doctrine with citizens demanding more and more social services often at the expense of business. Sound familiar? I won’t give any more of the book away because there are interesting twists and turns but the first page of the book contains the infamous phrase, “Who is John Galt?” This question is at the core of the book and if you understand the answer then you’ll understand Ayn’s perspective of the world. Side note: I understand this book is now under production by LionsGate. Rumors have it that Angelina Jolie will play the main character (Dagny). After the dot com crash, many friends gave up on the market and resided to either move their money into cash or invest in highly conservative mutual funds. Not happy with either of those choices, despite losing some money in the crash of WorldCom, I decided to invest in a little investment education. I purchased various books only to be greatly disappointed. That sentence has stuck in my mind for the past two years and changed my whole philosophical outlook on investing. The book is essentially written as a story about an older couple that is running out of cash during their retirement years. Eager to find a new way to create cash flow, the main character, Jake, meets up with an old finance professor who has been phenomenally successful in investing. Jake asks the professor to teach him how to make money off of the stocks he owns the way the professor has been doing so successfully over the years. The next few chapters are dedicated to “teaching” Jake how making money from stocks by using Covered Calls is a very conservative way to generate cash flow from existing investments. The book is easy to read and can be done so in a long sitting. What I really like about this book is that you will learn something new the second and third time you read it. I have taken what the professor “taught” Jake and expanded it to focus strictly on Exchange Traded Funds. It is primarily because of this book and the lack of information it contains out in the financial blog world that I decided to start this blog! Needless to say, I HIGHLY recommend this book as an eye opener into the world of covered call transactions and the methods for creating cash flow from stocks you may already own. A friend picked up Ray Lucia’s Buckets of Money at a seminar he gave a year or so ago and passed it on to me. I enjoyed reading the book but my first and immediate impression as I began to read it was that it was geared toward “older folks” who had already accumulated a sizeable nest egg and were closer to retirement (late 40’s and older). This book doesn’t offer advice on how to get your nest egg up to 300k nor does it have any “system” for stock picking or advice on trading nor does it tell you to “skip the latte” every morning; it is a strategy book on what to do with the nest egg you’ve already built up. The strategy is fairly simple and straight forward. Ray advices the creation of three “buckets of money” to secure your financial future. The strategy takes advantage of the time value of money and growth for Buckets 2 and 3. I’ll break down an example of how I think the mechanics of this would work. Say you need $2000/month to live on during your retirement years. In Bucket 1 you would put 24k into a money market account from which you will draw 2k for monthly expenses. You now know that this bucket will only last a year before it empties. Meanwhile, in Bucket 2, you have 100k or so in a conservatively safe income producing investment. Whether high dividend yield fixed income securities of income funds and bonds, you keep the money safe but growing. While Bucket 2 grows income, Bucket 3 is a little more aggressive and should yield higher returns and growth. Because the window for using Bucket 3 is far away, any “shocks” to the money bucket because of downturn in markets will be offset by the longer time horizon. The mechanics are simple, as Bucket 1 empties; siphon another 24k from Bucket 2. This process repeats until Bucket 2 is empty at which point you draw funds from Bucket 3 and pour into Bucket 2 which then funds Bucket 1. I’d love to see Ray Lucia come out with a book that focuses on the younger generation and longer time horizons but the book is a good read and I’d recommend it to everyone who would like to see effective long term financial planning theories and ideas from a veteran investor.